I was minding my own business in the grocery store, attempting to stock up on vast quantities of chocolate and heavy cream, when the eggplants called to me. They were purple and shiny and cuter than any vegetable should be. Naturally, I immediately purchased one, and it was only once I got home that two things occurred to me: one, I had never bought an eggplant before! What a momentous occasion. And two, I had absolutely no idea what to do with it. Luckily, the internet came to the rescue, as it generally does. 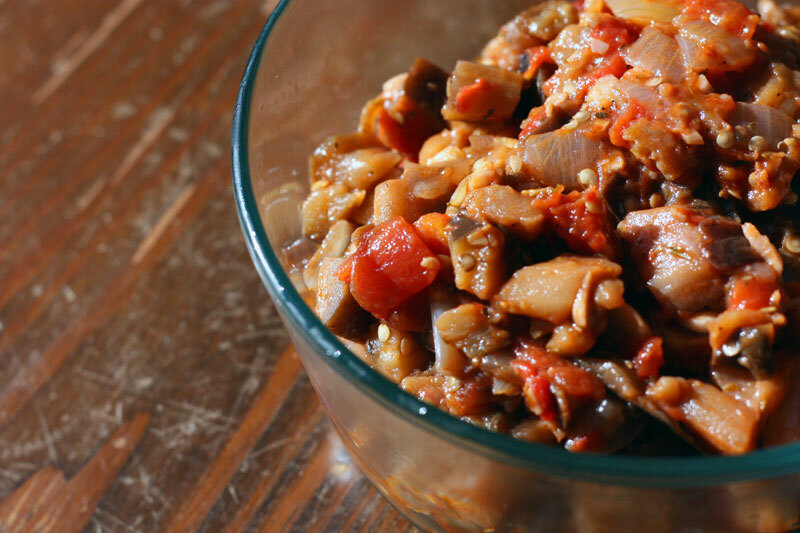 Several sites mentioned ‘caponata’, which I’d never heard of, but sounded delicious: tomatoes, onions, and eggplant all sautéed together into a warm and flavourful stew-like spread. And as an extra selling point, the name sounds all exotic even though I secretly know it’s really easy. Now of course, it would have been better if I had gotten my lazy self out the door to buy fresh basil, but it is cold and I am a wimp. So I made do with dried and it was yummy all the same. I was also mildly intimidated by the massive pile of eggplant chunks that this unassuming vegetable yielded, but it turns out they all cook down and it really does turn into a more reasonable quantity of food. As for what to do with it: I spooned this while still piping hot onto toast, but it would be even better on baguette with goat cheese, and I suspect it would make a good pasta topping as well, maybe with extra tomatoes and sprinkled with Parmesan and pine nuts. 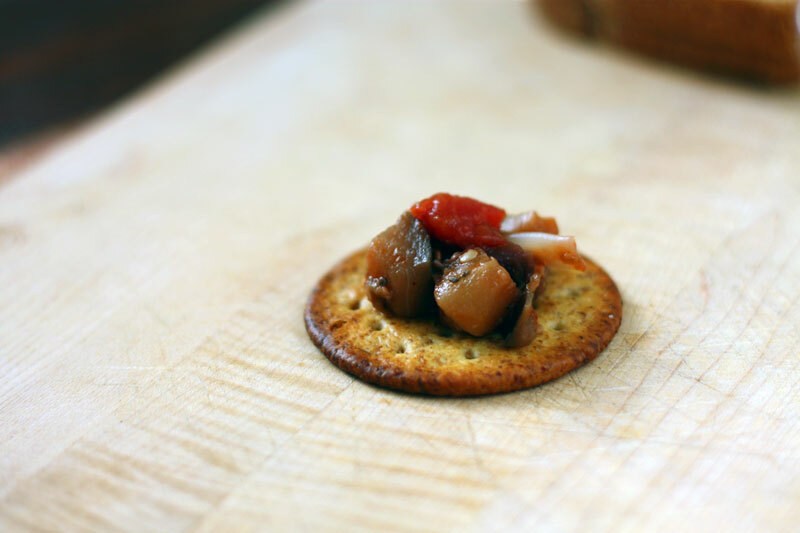 Basically the idea is: caponata + carbs = some kind of delicious. Please excuse the ugly photos – I was in a rush and just snapped a couple. 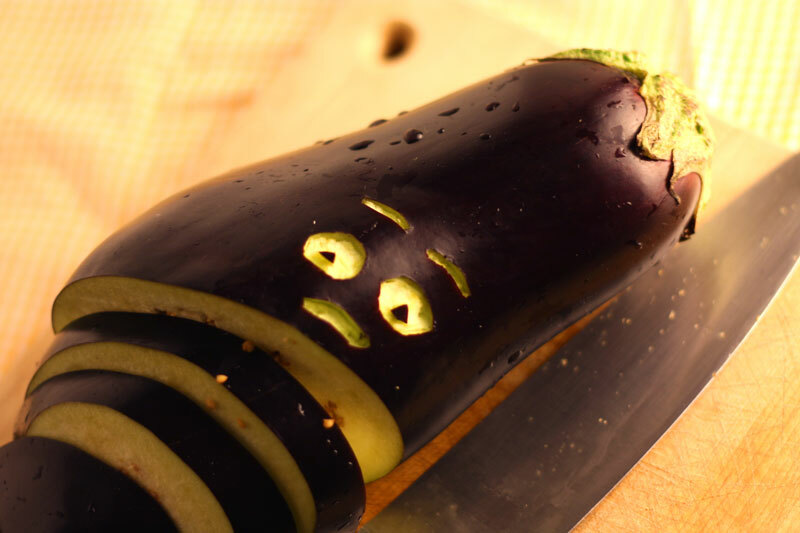 To compensate: I present this picture of what happens when you leave eggplants alone with my roommate. Heat oil in heavy large pot over medium heat. Add eggplant, and onion, and sauté 10 minutes. Add garlic and continue to sauté until eggplant is soft and brown, about 5 more minutes. Add diced tomatoes with juice, then red wine vinegar – if using dried basil, add here as well. Cover and simmer until eggplant and onion are very tender, stirring occasionally, about 12 minutes. Season caponata to taste with salt and pepper. Mix in fresh basil, if using. Transfer caponata to serving bowl. Serve warm, at room temperature, or cold. Notes: This recipe takes a lot of salt, I needed to add quite a bit. The vinegar flavour was also fairly pronounced, which I enjoyed, but if you’re not big vinegar fan you might want to start with less. This is an all time favorite recipe of mine. I definitely am going to try your version! You are currently reading caponata at one cake two cake.